For your consideration an authentic Louis Vuitton Illovo MM Damier handbag. The shoulder strap is 22" long. The date code is AR0095. The bag was manufactured late 2005. 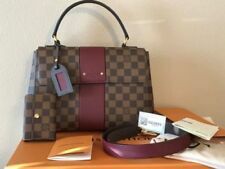 100% Authentic LV Croisette Damier Azur. Height: 9.1 Product Line: Louis Vuitton Damier. Handle/Strap Material: Leather Lining Material: Leather. Depth: 3.3 Material: Leather. Pattern: Check Product Line: Louis Vuitton Neverfull. Neverfull large size MM. Colour: Brown. New ListingLouis Vuitton Kensington Damier Ebene 100% Authentic, Made in France, Pre-Loved! Louis Vuitton Kensington Damier Ebene 100% Authentic, Made in France, Pre-Loved! Bought it in Las Vegas. You will love it, too! Excellent condition with all original accessories: strap and dust bag included. Smoke free home. Will ship immediately UPS 2nd Day Air. 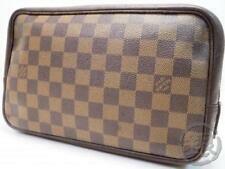 100% Authentic Louis Vuitton Graceful MM Damier Azur Canvas. Looks brand new I used a few times only. Excellent condition. Have a very tiny water stains in the handle you can see that in the photos. Inside looks like new. Comes with dust bag and original receipt. Size: W 16" x H 12" x D 4"
Damier Ebene canvas exterior. Date code is FL4188. Interior Flat pocket. Flap & clasp closure. Authentic Louis Vuitton Damier Azur Graceful PM. INCLUDES: Louis Vuitton Azur Graceful PM and dustbag. No extras. The Graceful is a beautiful hobo bag. It is a lightweight hobo. The PM is too large yet has room to hold all of your daily necessities. LOUIS VUITTON Brown Damier Ebene Bastille Messenger Bag. Condition is Pre-owned. Shipped with USPS Priority Mail. 100% Authentic Louis Vuitton Graceful PM Monogram Canvas with Pivoine Interior. INCLUDES: NEW- Louis Vuitton Graceful PM with dustbag and copy of receipt in orange envelope. You can't go wrong with this lovely hobo bag! Outside Level D Inside Level C Pocket C Shoulder strap D. Shoulder strap condition:dirt, scratches, worn,split(pic#11). Pocket condition:dirt,worn,discoloration. Outside condition: worn, scratches,dirt(see pic#11),handle base rivet missing(need repair). This item is worn but still very usable. Zipper is still intact and still works. A few scuffs along the dark brown leather base but in relatively good condition. Strap is all intact and has very minor wear (I used a gold chain as a strap so it’s was hardly used) great condition. 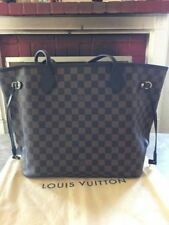 Pre owned Louis Vuittion Damier Neverfull GM With Pouchette. Shipped with USPS Priority Mail. Bag Exterior- Canvas has no cracks. No rips. Has some indentation. Corners are in great shape. Handles has normal wear shown on pics. Canvas has some staining. Overall in great shape. Bag Interior- No rips. Some minion stains. Overall in excellent condition. Pouchette Exterior- No crack on canvas. No rips or stains. Overall in excellent condition. Pouchette Interior- No stains or rips. Overall in excellent condition. No dust bag. Comes with box & shopping bag. A beautiful "Croisette" bag from Louis Vuitton in Damier Ebene. Louis Vuitton. FL3156 (2016). In Very Good Condition with one white spot on inner flap shown in pics. This bag features a squeeze latch, top handle and a detachable cross body strap. This compact tote is crafted of Louis Vuitton damier azur checkered canvas. This bag features signature azur cowhide leather trim including a top handle and an optional shoulder strap. The bag has a flap secured by a brass S-lock and opens to a pink fabric interior with a patch pocket. 100% Guaranteed AUTHENTIC LOUIS VUITTON TOTALLY MM Azur SHOULDER TOTE Bag is in Great pre-loved Condition. Very clean interior has minor stains. Canvas is very soft and in great shape has slightly faded around zipper and corners. Vachetta is light color has normal signs of usage such as darkening and stains. Zipper runs smoothly. Measurements: W 16 7/8" x H 11 3/4" x D 6 3/4". Date Code: MB1132. Includes Dust Bag. Condition is Pre-owned. Width 15cm or 6”. Length 33 cm or 13”. :W 7.1 x H 5.5 x D 2 Strap Drop 7.9. Size in cm (approx.). :W 18 x H 14 x D 5 Strap Drop 20. However, it is difficult to show every angle of each item. The product pictures may not show the exact color of the item due to the wide range of computer monitors and color displays and the lighting conditions etc. However, it is difficult to show every angle of each item. Junk Unusable Need repair. The product pictures may not show the exact color of the item due to the wide range of computer monitors and color displays and the lighting conditions etc. LV Damier Ebene Ipanema GM. Made of Louis Vuitton's signature damier canvas, this handbag features a dark brown leather shoulder strap with polished brass hardware and matching trim for the wide front pocket. Damier Ebene canvas and small-grained cowhide leather. Damier canvas looks fresh, paired with supple small-grained leather. Small-grained cowhide leather trim. Leather top handle. 100% AUTHENTICITY or Your Money Back. Authentic LOUIS VUITTON Geronimos Damier Ebene Shoulder Bum Bag Pouch #31082. Condition is Pre-owned. Shipped with USPS Priority Mail.bought here, but don’t use it. So it’s up for sale at this low price. Money back guarantee authentic. LOUIS VUITTON Soffi handbag shoulder bag Damier Azur Ivory New AH1193 (on the inside pocket). Measurements Length: 15 in Width: 8 in Height: 11 in Drop: 9 in 100% Authentic Date Code :SD2162 Comes with dust bag Smoke free home In great condition some rubbing on the corners Some pen marks in the interior as shown in the picture Signature is required upon delivery Please if you're not familiar with Louis Vuitton you send my photos to a professional authentication of your choice before purchasing! please feel free to ask any questions before purchasing! Measurements Base Length: 11 in Longest Length : 13.25 in Height: 8.25 in Width: 6 in Drop: 6.5 in Comes With: dust bag, lock, 2 keys In Excellent Condition barely used 100% Authentic From a smoke free home Date Code :DU5112 Signature required upon delivery Please if you're not familiar with Louis Vuitton you send my photos to a professional authenticator of your choice before purchasing! please feel free to ask any questions before purchasing! Louis Vuitton Eva Clutch Color: Damier Azur 100% Authentic New never used No longer in production Item will arrive with its dust bag, shoulder strap and copy of receipt. Purchased Feb 22, 2017. Can be carried as a clutch, shoulder bag or crossbody bag. Free shipping with signature required. All sales are final and no returns will be accepted. Thank you! Authentic Louis Vuitton Damier pattern handbag/shoulder bag with designer red lining in excellent condition. Perfect condition. You will LOVE this bag. BNIB Louis Vuitton Sperone Damier Azur White Coated Canvas Backpack. It’s a brand new bag with a dust bag, box and an original receipt. Measurements Base Length: 7.5 in Height: 8.75 in Width: 4 in Drop: 1.25 in Adjustable Drop: 22 in Accessories: Straps (detachable) If you have more questions, please ask me. Thank you! I have carried this in my Damier Neverfull. F rom my own closet, the condition is good pre-owned. There are small rubs on one bottom corner and the tab at zipper (photographed), which are barely noticeable. This classic tote is crafted of Louis Vuitton signature checkered damier ebene brown canvas. This bag features brown vachetta leather rolled top handles, an optional shoulder strap, trim as well as polished brass hardware. This stylish shoulder bag is finely crafted of Louis Vuitton signature damier canvas. The shoulder bag features a flat leather shoulder strap with polished brass hardware links and a magnetic leather closure. It is such a beautiful and well made bag. LV Louis Vuitton Westminster GM Shoulder bag. Featuring Damier Ebene canvas. Zip closure. Dual handles. Goldtone hardware. Zip top closure. Interior canvas lining in red. Condition: Great condition. Damier Ebene. LOUIS VUITTON VERONA PM. Condition is Pre-owned. 1 interior pocket. Shows signs of wear; Creases on handles, Scuffs on 2 corners; Light scratches on the hardware; Zipper works smoothly. Louis Vuitton Kensington Damier Ebene 100% Authentic, Made in France, Pre-Loved! Louis Vuitton has been making handbags and purses since 1854. If you want a Louis Vuitton Damier bag or handbag to fit your lifestyle, check out the wide variety of affordable options on eBay. What patterns and colors do they come in? The signature pattern of Louis Vuitton purses is a checkerboard pattern. This is the primary design of almost all Louis Vuitton bags, but other elements are often incorporated into the design. For instance, the color of the checkerboard pattern can vary. Tan and brown, light gray and dark gray, light silver and dark silver, and white and off-white are some of the color schemes. Some of the Damier purses also incorporate the initials or name Louis Vuitton into the design of the bag. Handbags: This type of bag has two straps for carrying it in one hand. Shoulder bags: This type of bag can have a crossbody design or one long shoulder strap. Wallets: Coin purses and pouches can be thrown inside a Louis Vuitton bag. Backpacks: This style of bag can be worn on the back for easier carrying. Totes: This type of bag has an open pouch at the top that makes it easy to toss large items inside. What are the straps on Louis Vuitton bags like? The straps are usually made of the same material as the bag. Sometimes it matches one of the colors in the bag, but sometimes the straps are a different color, such as gold. Additionally, the straps can be made of a different material, such as a chain. How do you choose a Louis Vuitton bag? Think about how you intend on using the bag, as this will determine the style that you choose. For instance, if you want to be able to easily fit large items, consider a tote. This type of bag is great for taking on day trips. If you like the convenience of carrying a smaller bag that fits a wallet, phone, keys, and a few smaller items, either a shoulder-strap purse or a handbag will be a great option. The backpack bag, like the tote, is great for fitting in larger items, but it has the added convenience of two straps for when you're walking long distances. Content provided for informational purposes only. eBay is not affiliated with or endorsed by Louis Vuitton.